SEBRING, FL – March 19, 2018 –At the classic 12 Hours of Sebring (USA), the new BMW M8 GTE celebrated its maiden podium finish. After 328 laps, Alexander Sims (GBR) finished round two of the IMSA WeatherTech SportsCar Championship second in the GTLM class at the wheel of car number 25. 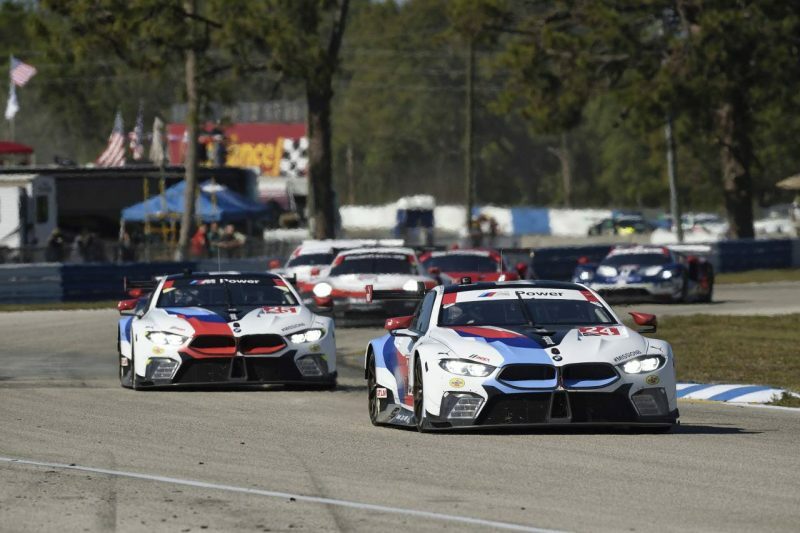 He had shared driving duties with fellow BMW Team RLL drivers Connor De Phillippi and Bill Auberlen (both USA), leading the pack in some phases of the race. 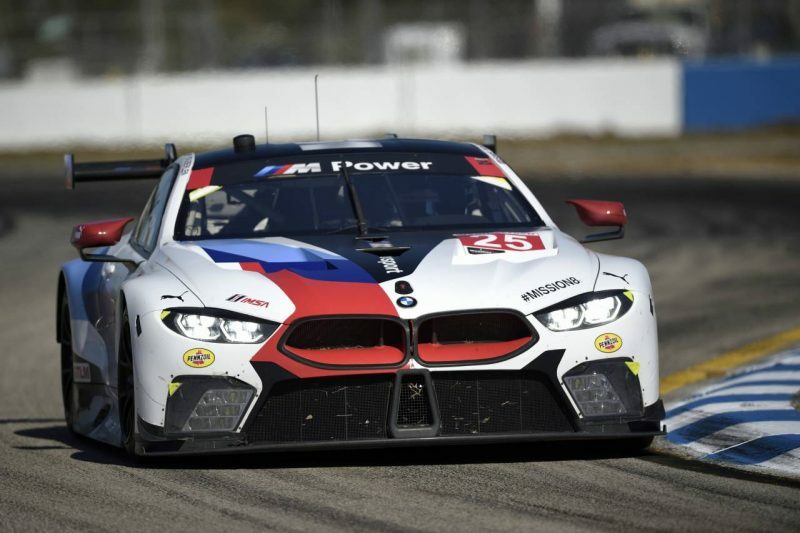 The number 24 BMW M8 GTE – driven by Jesse Krohn (FIN), John Edwards (USA) and Nick Catsburg (NED) – had to retire in the final hour of the race. The number 911 Porsche secured victory, just 6.230 seconds ahead of the second-placed BMW M8 GTE. IMSA WeatherTech Sportscar Championship 2018, 66th Annual Mobil 1 Twelve Hours of Sebring Presented By Advance Auto Parts, Sebring International Raceway, Sebring, FL (USA). Alexander Sims (GBR), Connor de Phillippi (USA), Bill Auberlen (USA), No 25, BMW Team RLL, BMW M8 GTE. Podium Celebrations. 2nd Place GTLM Class. De Phillippi, Sims and Auberlen did a flawless job in the cockpit after starting from pole position. Their BMW M8 GTE mastered the tough 12 hours of racing without major technical issues. Following a brake change towards the end of the first half of the race, the trio lost a lap to the leaders, but managed to keep their cool and fought back into the group of front-runners. Sims was able to secure the first podium finish for the newly developed BMW M8 GTE as final-stint driver. 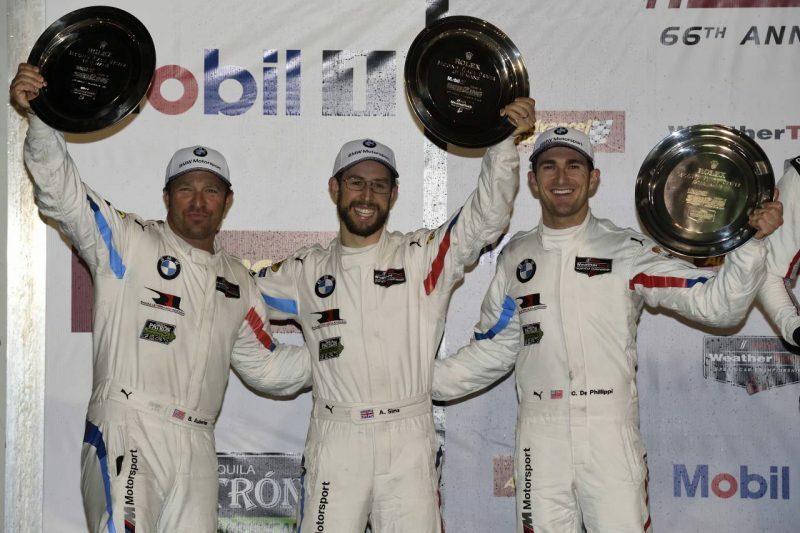 In total, it was the 69th podium for BMW Team RLL and the 26th runner-up finish since 2009. IMSA WeatherTech Sportscar Championship 2018, 66th Annual Mobil 1 Twelve Hours of Sebring Presented By Advance Auto Parts, Sebring International Raceway, Sebring, FL (USA). Jesse Krohn (FIN), John Edwards (USA), Nicky Catsburg (NLD), No 24, BMW Team RLL, BMW M8 GTE. For car number 24 the race took a decisive turn after four hours and 17 minutes, when there was a collision between the BMW M8 GTE and the number 66 Ford GT. Edwards had to head back to the pits with a water leak and some extensive repair work followed. The car rejoined the race nine laps down from the leaders. Edwards, Krohn and Catsburg ultimately had to retire in the final hour of the race. However, the trio recorded the fastest GTLM lap – a 1:57.622 set by Krohn on lap 21. Car number 24 had also led the field in the early stages of the race. 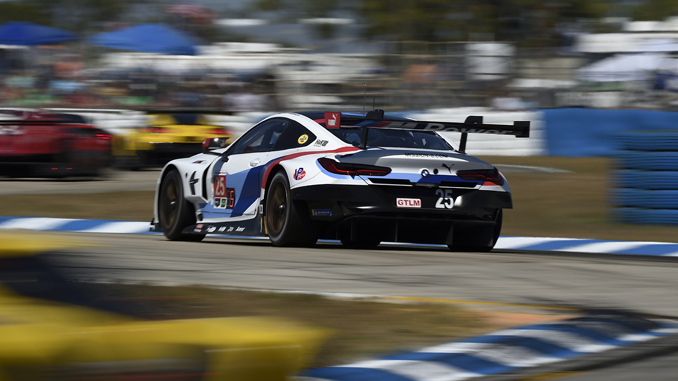 The Turner Motorsport team delivered a fighting performance in the GTD class. From 16th place on the grid, Don Yount (USA), Dillon Machavern (USA) and Markus Palttala (FIN) improved to 11th position with the number 96 BMW M6 GT3. In the Continental Tire SportsCar Challenge race on Friday, Classic BMW’s Toby Grahovec and Jayson Clunie (both USA) had reason to celebrate after finishing second with the number 26 BMW M4 GT4. The IMSA WeatherTech SportsCar Championship will resume on 14th April with round three of the season held at Long Beach (USA). One week prior, the BMW M8 GTE will continue “Mission8” at the Prologue for the FIA World Endurance Championship (WEC) at Le Castellet (FRA) on 6th April. IMSA WeatherTech Sportscar Championship 2018, 66th Annual Mobil 1 Twelve Hours of Sebring Presented By Advance Auto Parts, Sebring International Raceway, Sebring, FL (USA). Alexander Sims (GBR), Connor de Phillippi (USA), Bill Auberlen (USA), No 25, BMW Team RLL, BMW M8 GTE.